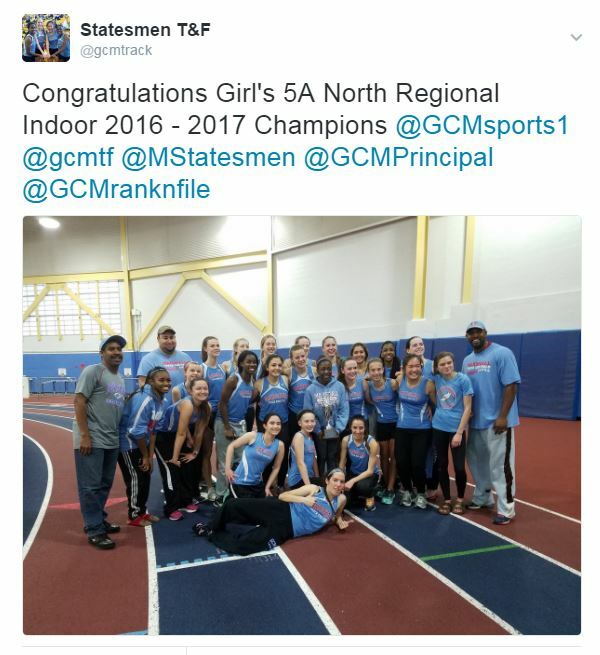 Girl’s Winter Track and field team repeated as conference champions in dominating fashion, boosted by contributing performances from all parts of the team. 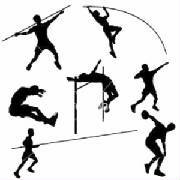 Last year, they entered the last day down 50 points after Thomas Edison HS loaded up the field events. The girls made it their mission that it would not happen this year by having loaded performances of their own, dominating the high jump event by taking four of the top 7 places and just missing putting a 5th jump into the score. Led by Senior Inga Schlier who had not jumped in two years with a regional qualifying and runner up performance of 4 ft 9 in. Junior Fiona Rickels, the lone jumper for most of the season took 3rd, new comers Junior Rebecca Winicour and Senior Amanda Tooke placed 4th and 5th respectively, with 4 ft 5 in jumps, and Freshman Noelle Lewis placed 8th with a 4 ft 3 in jump. In total, the girls captured 19 points compared to last year’s 2 points leaving Edison to collect only 1 point for that entire event. Marshall Throwing has been consistently strong over the last 20 plus years and this year was no different as Sophomore Delaney Stuart collected another title for the Statesmen with a personal best of 29 ft 7 in. Senior Alexandria Stenseth repeated her 3rd place from last year with 27 ft 7.75in. Long Jump and Triple Jump has never been our stronger event so capturing any points is big because limits the points our opponents can earn. Senior Thando Muchemenyi delivered for the team, by placing 5th in the Triple jump with 31 ft 2 in for two points and sophomore Jemalyn Dacanay and Senior Hannah Smith take 5th and 6th in the long jump, giving the team a 6 point haul. 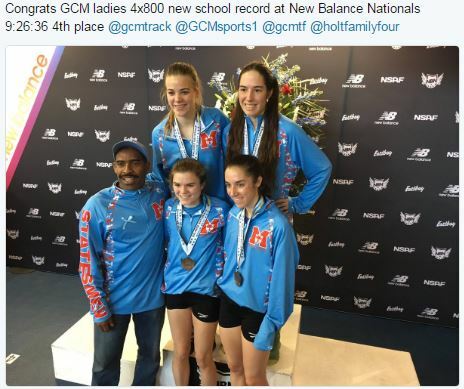 With the field events, the team scored 38 points compared to last year’s 29 points as they headed into their favorite and possibly easiest event of the meet, the girl’s 4x800m relay team. Marshall has dominated this event, crushing the competition each year. In the last three championships – the team has lapped the entire field, breaking the sub-10 minute mark. This year, it was not a question of whether they would lap the field or break 10 minutes – it was how low they could go. Led off by Senior Hannah Smith running her 2nd 800m of the season – she led off with a 2:28 to put the team in the driver seat, Senior Jenna Robbins extended the team lead with a 2:25 second leg and handed off to junior Ava Bir who laid down the hammer with a smashing 2:17 third leg and then junior Heather Holt weaved through the lapped field to polish off a superb win with a 2:15 final leg for a new school record, new meet record, new state number one time, Penn Relays Qualifier, and National Championship qualifier mark of 9:28. If that excitement was not enough, you did not want to miss the Girl’s 55m hurdle finals, Senior Inga Schlier led the conference ranking all season and increase her lead after another personal best in the preliminary round of 9.12. Junior Michelle Dirkse dropped over half a second to keep pace going from 9.76 to 9.15. The final was setting up to be quite exciting between the two teammates. From the very start, it was hurdle by hurdle, step by step and both leaning for the line so that no one knew who had won. A true photo finish so that we had to go to the computer. The results showed a dead heat to the line of 9.13 for both Michelle and Inga. The race official had to go to the 1000th on the screen to make the decision – Michelle had won – 9.121 over 9.128 for Inga. 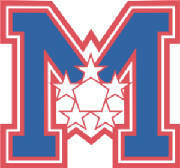 There was a time when Marshall won six straight 55m dash titles in the Liberty District by Jacqueline Hargrove, Shannon McVey and Brittany Johnson with these three past winners being the only 3 ahead of Sophomore Kristen Hamilton in the last seventeen seasons. So, Hamilton certainly showed she had the talent to get the Statesmen back to their rightful place among the fastest 55m dash competitors in the field. 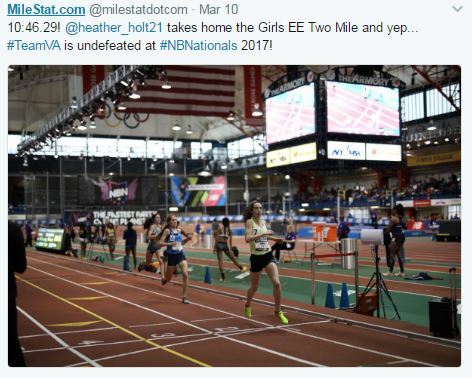 She made light work of the prelims running close to her personal best with 7.69 on the clock; however, it would take an another personal best to grab the title as the Edison runner broke the meet record of 7.42. The start was the key, Hamilton had a decent start and put herself in position to win, pushing to the line – she again achieved another personal best of 7.52. From the outside lane, though, the Wakefield senior stole the title from both Edison and Marshall by tying the meet record. Hamilton and her teammates closed out the first day with the Lady Statesmen not down 50 points but up 13 points going into day two. The second day of the championship was incredibly better than we could have scripted it. Starting with the Girl’s 4x200m relay team, the girls were undefeated for the next four finals to extend their leave by over 40 points. The 4x200m team of Jemalyn Dacanay, Thando Muchemenyi, Nina Orozco (running with one hamstring for the last 100m) and Khristen Hamilton won the first event to start the day. 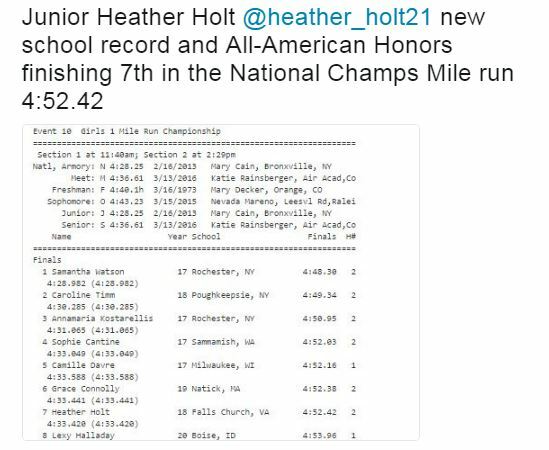 Junior Heather Holt continued her undefeated streak in conference championships, winning the 1600m run breaking her own meet record with a state Qualifying mark. Freshman Sophie Tedesco would follow close behind with her own state qualifying mark to take 2nd in the event. Senior Lauren Deaver running the event for the 2nd time all season pulled out a sprint to take the final regional spot in a new personal best. Junior Ava Bir expecting to be challenged, started fast and left no doubt to collect her 3rd 500m crown with a new meet record and personal best. Senior Hannah Smith qualified for her 3rd regional 500m race with her 5th place finish. Senior Jenna Robbins continued the Statesmen dominance by collecting her first 1000m title in a new meet record as well, as she was followed home closely by fellow senior Layan Qasem with her first individual championship medal -taking 3rd in the event. The Statesmen winning streak would end in the 300m dash, but Freshman Aisha Hinds proved hope for the future with a streak run in the lower heats to take 5th in the event and qualify for the regional championship. Holt and Tedesco would return to double up the event and duplicate the same results with Holt winning in a new meet record (her own), and state qualifying time and Tedesco taking 2nd in a regional auto qualifier and personal best. The 4x400m relay was an all senior affair with Deaver, Kelly Batsford, Qasem and H.Smith – the team battled but trailed most of the race. On the final leg, Smith was down 20 meters and had to put in a huge effort. She would come all the way back to take the lead; however it wasn’t enough to hold off the Thomas Jefferson team. 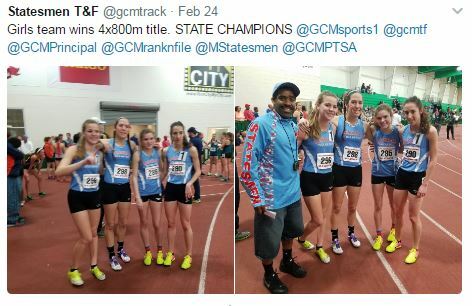 The 4x4 team though added to the final tally of 159 points to make the winning margin 68 points (159 to 91). And with the finish, the Lady Statesmen delivered for the first time in 21 years – back to back Conference/District titles for the school.